Every year, inspired individuals leave the common culture of our modern age. They build a temporary city in the desert to experiment with an imaginative new culture based around gifting and acceptance. These gatherings have the capacity to change lives by filling participants with awe and shocking them out of complacency immersed in a rugged desert climate. Impactful organizations have spawned from this culture including Black Rock Solar who is moving more than 4.7 megawatts onto the grid, enough to power 1,365 homes. About a third of the profits have gone to Native American populations and the rest went to schools, community colleges, churches, food banks and homeless shelters. There’s also Burners Without Borders who participates in disaster relief around the world. But considering the thousands of participants, who have attended the festival over the past decades, shouldn’t there be more innovative and purpose-driven organizations birthed from these parties? 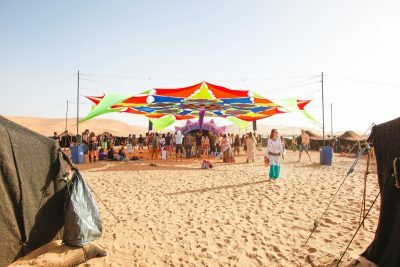 Desert parties opened our eyes to a way of relating with other humans that fosters deep connection, compassion, non-judgement, and full authentic expression. It also opened our eyes to village life and seeing that we are capable of anything we want to create. After a few years of attending, we realized that rather than spending hundreds of dollars, preparing for months, burning many tanks of gas and contributing to a festival that encourages consumerism through costumes and luxuries and ends up producing significant waste, we could actually be in service to permanent eco-communities. These projects remind us of these parties because they offer the truly blissful lifestyle while the “work” has a meaningful long-term impact on humanity and the planet. Are these desert parties yet another symbol of our extractive society? With our climate crisis worsening due in part to the effects of CO2 emissions, we have a duty to live in integrity to our values. Burners (us included) are passionate about their celebration because it helps them make big life transitions and gives them hope for what is possible when inspired individuals come together. BUT- let’s not ignore what these festivals are at their core- parties in the desert. When 70,000 people travel to a desert from all across the world to indulge in this peak experience, there is a carbon output of 12,500 tons according to the public BLM report. 6 million gallons of fresh water is sprayed on the ground to reduce dust, adding to the challenges of climate change. Running a temporary city for a week means putting time and money into lavish temporary living structures- something victims of the Louisiana flood could actually really use. Beyond the actual carbon emissions, we are demonstrating to ourselves and others that it’s ok and justified and limit our awareness. If a festival is a potent reminder that we’re capable of anything as a species, why wouldn’t we evolve beyond it? Trade in attending the burning of metaphoric men for living its principles every day while regenerating our earth. What if there were regional celebrations with the same values and energy of these festivals that also included work parties in support of grassroots projects? This is true community building. It brings the energy of the gathering from just a raging substance-ridden party to an eclectic gathering of capable leaders of change. 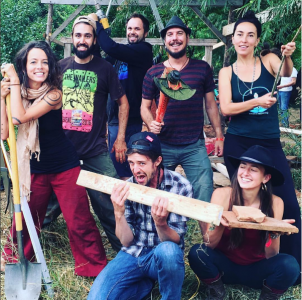 Permaculture Action Network & Action Days are on the forefront of this movement by fusing land work with party vibes and musical performances by artists such as Rising Appalachia & The Polish Ambassador. This is because we can still have truly transformative experiences and find hope from within our bioregions without the one big party in the desert. If we’re going to transition our extractive economies to those that support life, we are better than this. Our parties can support the sequestration of carbon into degraded land and heal watersheds at the same time. 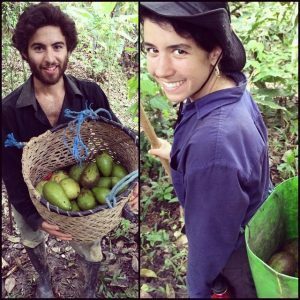 There are hubs all around the world showcasing practical solutions for a sustainable and regenerative existence on earth that you can visit and collaborate with! Quail Springs whose stream went from 3 gallons per minute to 60 gallons per minute and have adorable examples of tiny houses made from Earth. East End Eden turns over 12,000 pounds of “food waste” into rich soil yearly thanks to their pigs and are building a pond that will harvest a 1.5 million gallons of drinkable water that otherwise would run off into the ocean from just a few days of rain in drought stricken California. The Emerald Village whose visioned and co-created a 5 family successful, heart-centered and co-parented eco-village that practices alternative governance models and effective and responsible communication practices. Wild Willow Farm who cultivates resilient local food systems and trains up future sustainable farmers. Even urban examples like LA Ecovillage whose been established for over 20 years and has developed a highly functioning urban ecovillage demonstrating techniques for an ecologically, socially and economically healthy neighborhood. If you’re interested in an alternative to elaborate desert parties this year from October 1 – 12 2017, there is an 12 day journey on a biofuel bus visiting Southern California’s leading permaculture projects. It’s a chance to have a similar experience but gain education & life-long connection to support your vision.